posted by Matthew Bushey, AIAThis new series on the blog takes a look at the Top Five for designs that have recently caught our attention. The initial subject of our investigation is that which many of us designers are enamored with: the chair. When it comes to furniture design (and more broadly, the entire field of industrial design) the chair is the Holy Grail of form and function. Chairs have perhaps the most challenging performance requirements of any crafted object I can think of: they must be strong enough to support a full-sized adult, ergonomic for different body types, and comfortable for long stretches of time. A good chair should be one that you want to stand back from and admire as a work of art, but also one that invites you to walk up and take a seat. This list is intended to be a selection of some of our favorites, not a presumption that these are the top five best chairs ever produced. But with this first one, I’m going to break my own rule, and unequivocally state that this is indeed the top chair of all time. The Eames Lounge Chair is the classic example of mid-century modern design at its best. Designed by the dynamic American duo of Charles and Ray Eames and introduced in the 1950’s, the chair incorporated an innovative molded plywood shell, and was – and is still – a perfect example of modern elegance. It goes without saying that it fits you like a glove – a baseball mitt, to be exact. 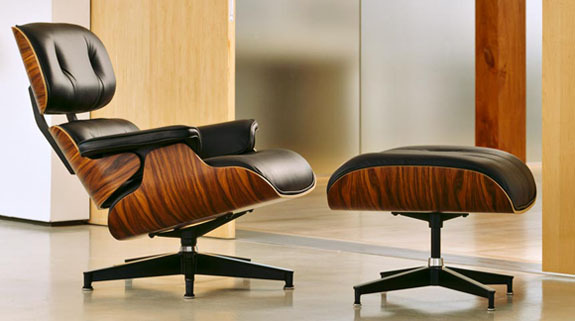 The Eames Lounge Chair is probably one of the most-imitated chairs out there. There are plenty of copies to be found. (Not that there’s anything wrong with that. I have a pretty decent knock-off in my own living room that has lasted for years.) One of the first things I notice when I come across an original it how small it actually is. It sits low to the ground and wraps snugly around you. You don’t feel lost when you sit. You feel like every curve is carefully designed to hold and support you. The other telltale signs of an authentic Eames are its lack of visible fasteners on the exterior surface of the bent plywood shell, and the die-cast aluminum 5-star base. This chair is 50 years old, but is still on the top of the list. The Dezza Armchair was designed by the Italian architect and furniture designer Gio Ponti for Poltrona Frau in 1965 and was more recently reintroduced by the company in 2003. The chair is modern, comfortable, lightweight, and sturdy. It was originally designed to be adaptable, able to be taken down and shipped anywhere. This is evident in the distinctive sharp cut of the slender arms and the simplicity of its construction, with exposed fasteners on the sides. This is an extremely stylish and unique chair. That a single piece can be so elegant, innovative and adaptable at the same time is reason why this chair is one of our top five. As the father of two small children, I couldn’t resist this adorable child’s chair from the Knoll Kids line of classic modern furniture. 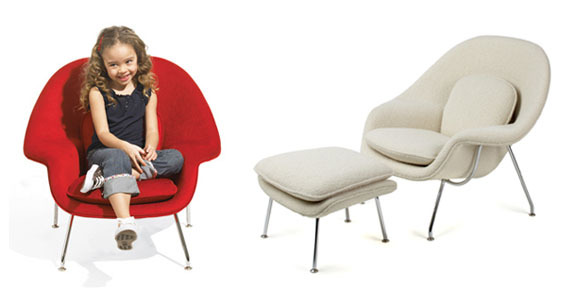 The folks at Knoll took the classic 1948 Womb Chair by Eero Saarinen and miniaturized it, shrinking it to child-like proportions. We saw this chair at the NeoCon trade fair in Chicago two couple years ago sitting alongside its adult counterparts. The standard version already comes in multiple sizes, so it was natural to extend the family to include the kids. The Womb chair is a modern, playful piece, so it’s the perfect chair to make child-sized: casual, comfortable, and stylish. This is a new chair by the upscale casual furnishings company JANUS et Cie. It’s similar to the Vegetal Chair by Vitra, but I like the more intricate pattern on this one much more. And while the Vegetal chair is plastic, the Forest chair is constructed of powder-coated die-cast aluminum, so it’s very sturdy. 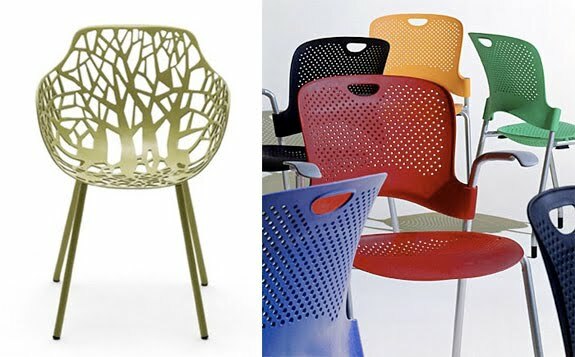 As you can see, the Forest Chair takes an organic motif of a leafy forest and wraps it onto a single, fluid surface. Our Janus rep brought one by our office when it was released, so we can vouch for its comfort. As designers in Vermont, we could easily see this chair as a beautiful complement to any one of a number of our projects around here. It’s modern, but contextual. I had wanted to spread the wealth here, but I have to include one more chair by Herman Miller. The Caper Chair to me is the best example of a lightweight, comfortable, and stylish office side chair. Did I mention this thing was lightweight? It is very light: you can lift this chair with one finger. Yet it sits firmly on the ground. It is unassuming and performs flawlessly when you want it to – with comfort, strength, and a bit of flex – but is also artfully sculpted when you stop to take a look. Are there other examples of stellar seating that you think I should have included? Leave a comment and share your favorite.